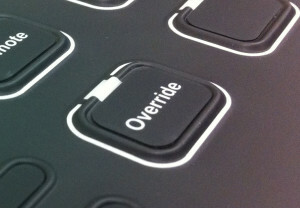 Keytouch offer customized embossing on all of our graphic overlays. Embossing can add to the uniqueness of a membrane switch, and can also be useful in helping an operator establish finger position or differentiate one switch from the other. Embossing other features, such as your company logo can further add to the individuality of your equipment.